The pivotal role of neuroinflammation in epilepsy has long been observed. Both innate and adaptive immune systems have been suggested in several experimental and clinical studies. Immunotherapy including steroids and intravenous immunoglobulin has been shown to be effective in treating certain childhood epilepsy syndromes. There has been an increasing recognition of autoimmune encephalitis associated with neuronal autoantibodies. Likewise, detection of neuronal autoantibodies in individuals with new onset seizures and drug-resistant epilepsy has been noted. Active inflammation has been demonstrated not only in Rasmussen's encephalitis, the prototype example of inflammatory epilepsy, but also in limbic encephalitis and temporal lobe epilepsies. The present topical issue aims to provide a comprehensive review of the current knowledge of childhood autoimmune and neuroinflammation-related epilepsies. In the first article, Bagla and Dombkowski will give the difficult task of reviewing the basic science aspects of neuroinflammation in epilepsy. Their section will set the mood of our discussion. 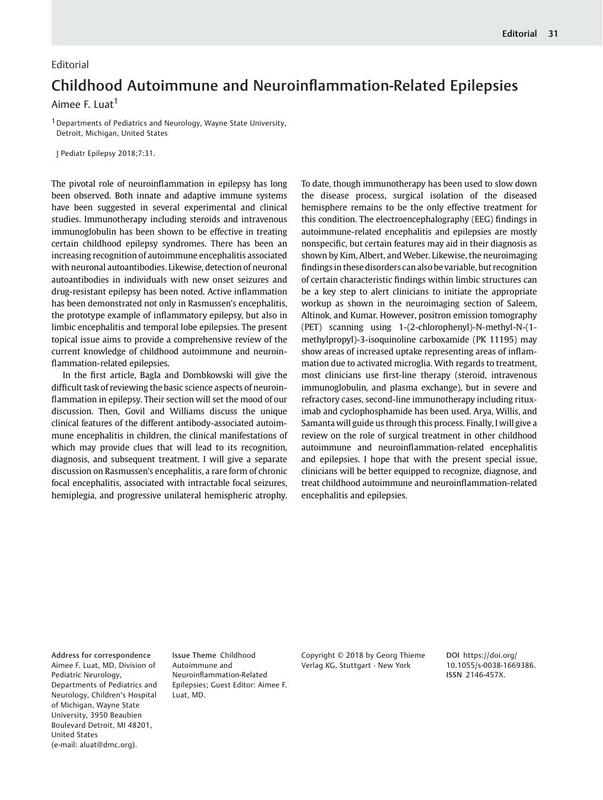 Then, Govil and Williams discuss the unique clinical features of the different antibody-associated autoimmune encephalitis in children, the clinical manifestations of which may provide clues that will lead to its recognition, diagnosis, and subsequent treatment. I will give a separate discussion on Rasmussen's encephalitis, a rare form of chronic focal encephalitis, associated with intractable focal seizures, hemiplegia, and progressive unilateral hemispheric atrophy. To date, though immunotherapy has been used to slow down the disease process, surgical isolation of the diseased hemisphere remains to be the only effective treatment for this condition. The electroencephalography (EEG) findings in autoimmune-related encephalitis and epilepsies are mostly nonspecific, but certain features may aid in their diagnosis as shown by Kim, Albert, and Weber. Likewise, the neuroimaging findings in these disorders can also be variable, but recognition of certain characteristic findings within limbic structures can be a key step to alert clinicians to initiate the appropriate workup as shown in the neuroimaging section of Saleem, Altinok, and Kumar. However, positron emission tomography (PET) scanning using 1-(2-chlorophenyl)-N-methyl-N-(1-methylpropyl)-3-isoquinoline carboxamide (PK 11195) may show areas of increased uptake representing areas of inflammation due to activated microglia. With regards to treatment, most clinicians use first-line therapy (steroid, intravenous immunoglobulin, and plasma exchange), but in severe and refractory cases, second-line immunotherapy including rituximab and cyclophosphamide has been used. Arya, Willis, and Samanta will guide us through this process. Finally, I will give a review on the role of surgical treatment in other childhood autoimmune and neuroinflammation-related encephalitis and epilepsies. I hope that with the present special issue, clinicians will be better equipped to recognize, diagnose, and treat childhood autoimmune and neuroinflammation-related encephalitis and epilepsies.